This collection consists of National Security Council records related to Presidential Decision Directive, National Science and Technology Council 6 (PDD/NSTC-6), “U.S. Global Positioning System Policy.” The records in this collection date from 1987 to 2000 and include memos, drafts, and emails related to the drafting of PDD/NSTC-6. 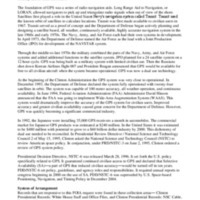 The collection contains briefing papers, reports, and presentations related to GPS, Differential Global Positioning System (DGPS), and Wide Area Augmentation System (WAAS).